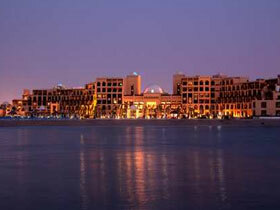 Hilton Ras Al Khaimah Resort & Spa Ras Al Khaimah UAE - Ras Al Khaimah Discount Hotels, Resorts & Apartments!! Hilton Ras Al Khaimah Resort & Spa Ras Al Khaimah - Ras Al Khaimah Hotels, Resorts & Aparments United Arab Emirates with Special Discounted on Published Rates!! Set in a lush and verdant private bay at the northern tip of the Arabian Peninsula, the stunning Hilton Ras Al Khaimah Resort & Spa overlooks the glittering Arabian Sea. Indulge mind and body in the luxurious spa, which features a traditional Hamam and 9 treatment rooms, hold a conference in one of 3 contemporary function rooms, savor cuisines from around the world in one of our 12 bars and restaurants or simply watch the sun set as you sip a cocktail on the white sandy beach. Stay with us... All Nationalities can stay with No Visa Required!! Affordable Hotels, Affordable Resorts & Affordable Hotels Apartment in Ajman, United Arab Emirates with Instant Confirmation & Last Minute Booking! !